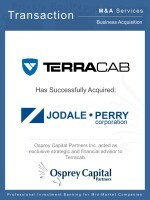 Osprey Capital Partners Inc. is pleased to announce that it assisted TerraCab Industries to acquire Manitoba based Jodale Perry Corporation, a leader in the design, engineering and manufacturing of ROPS Cabs products, providing some of the most striking designs and innovative engineering solutions available on today’s market for tractors, utility vehicles, golf course equipment, heavy industrial mining equipment and commercial heavy equipment applications. TerraCab has been involved in the development of projects for OEM clients from a broad spectrum of industries – providing design, testing, engineering and manufacturing services for ROPS guards, canopies, cabs and full composite bodies. TerraCab is a new company, fostered from the ownership of Argus Industries (its sister company) and will be based on the foundational LEAN culture that Argus Industries has been made known for throughout various articles, speaking engagements & media attention that their Serious/Fun Culture has brought them. Argus is a seal/gasket manufacturing company that specializes in many markets, from agriculture to aerospace, high tech to low tech and everything in between. Argus is a custom manufacturer of rubber molded products and custom die cut gasket seals. Argus Metals, a niche company in the family, does 3D Cad design for CNC Machining, lathe work, production metal parts and robotic welding. Argus has 2 locations based in Winnipeg, a branch plant in Pickering, Ontario and TerraCab Industries operates in Morden Manitoba. 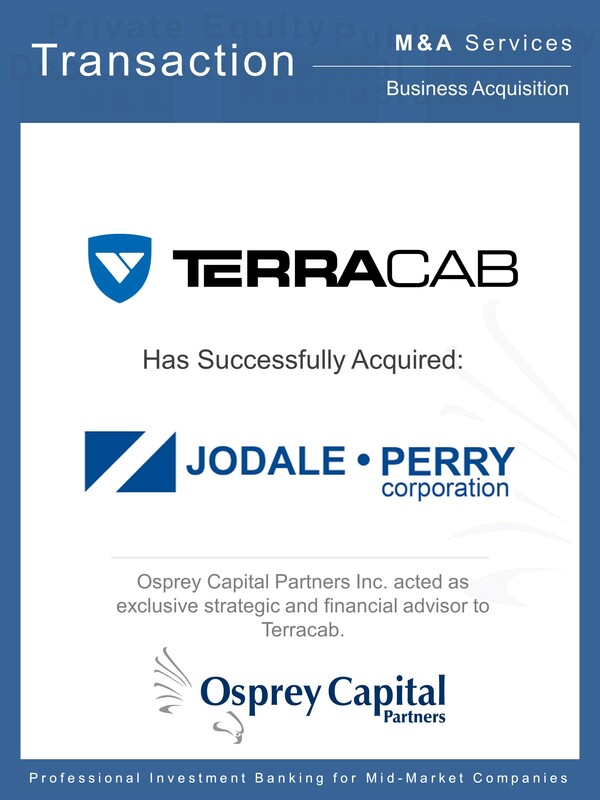 Osprey Capital was engaged by the owner of Argus Industries to assist in the sourcing, negotiations, structuring and closing for the acquisition of a business in the manufacturing space related to diversify Argus Industries footprint.